As we sat in our seats on the flight from Boston to France, our hands clasped, we couldn’t help but ask ourselves if this could really be happening. Only a week ago we had been married. We were so excited we barely slept, and mostly gazed out the window as the ocean, dark and absolute, drifted by. This had been our dream for as long as we had been a “we.” Kimberly never had the privilege of traveling overseas in her youth, and Ben early in our courtship had shared albums of photos from his past trips to La Belle France. Our shared love of wine, food and classical art made France our dream honeymoon. We were so excited to go to France that the theme of our wedding became increasingly Provencal as the big day neared, including sunflowers for the bouquets and origami cicadas for the boutonnieres. Of course weddings are prohibitively expensive, and a trip to Europe is never cheap. Lucky for us an inspired idea came our way: A honeymoon registry from Traveler’s Joy. We didn’t want plates or napkin holders, we wanted memories we could cherish for the rest of our lives. We settled on spending a week in Provence, and a week in Paris. 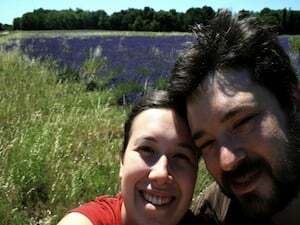 It was quite the undertaking, but we wanted to explore as much as we could while also allowing ourselves time to relax, and to spend time in both the city and the country. Our plan was to have a home base in each place enabling us to make day trips as the spirit moved us. To that end we set up our registry to allow people to give us nights in hotels, days with rental cars, meals, picnics and drinks. After watching the sun rise over the horizon and the richly detailed landscape of the country below growing clearer in the warm light, we finally landed at Charles de Gaulle and boarded a high-speed train for Avignon. Only a few hours later we arrived and picked up our rental car, which, as a pleasant surprise, had a built-in GPS. We would in the days to come get the urge to kiss this GPS we hadn’t realized we would need. We were delighted when we pulled into the small gravel courtyard parking lot of La Magnaneraie in the small town of Villeneuve-les-Avignon, just across the Rhone from Avignon. The hotel’s name literally means “The Silk Farm”, which is what it had been several hundred years ago. The exterior of ancient yellow limestone offset by ample gardens was surrounded by stone walls and shaded by enormous sycamore trees. We were charmed immediately. The gardens were full of flowering oleander and lavender, and nestled among it all was a small goldfish pond. Also, we found that our room was but a minute’s walk along a stone path to the hotel’s swimming pool. Our spacious suite was amply air conditioned, with a modern bathroom, charming furniture, and large windows. Thanks to TripAdvisor, we had taken a closer look at this hotel, which had not seemed so impressive online. We found it to be exactly what we needed: a quiet hotel in a small town, but centrally located and convenient to Avignon. In the days to come, the comfort and convenience would offer many a welcome escape from the heat for a cool nap or dip in the pool. Once settled in, we headed into town to find our first proper meal in France. We sat and soaked in the sounds of cicadas and children playing in the town square while enjoying light but satisfying fare of salad and pâté. Soon the need for sleep overtook us, and we headed back to our hotel. We rose for breakfast in the hotel courtyard, an ample offering of pastries, ham, and otherworldly local honey. A short bus ride over the wide, clouded Rhone brought us to the medieval walls of Avignon. We meandered through the city’s winding streets to the fortress-like Palais des Papes, walked the remains of the Pont d’Avignon, and hiked up to a hilltop park for commanding views of the Rhone Valley. Every vertical surface in Avignon was plastered with posters for the annual OFF Theater Festival, which we later learned is the largest independent theater festival in the world. The sheer number and variety of posters boggled the mind. After an outdoor lunch, we visited a shop to buy saucissons. The shopkeeper immediately offered us samples, and despite a profound language barrier, helped us leave with wild boar and duck sausages for future picnics. Our dinner that evening was a fantastic meal at La Banaste in Villeneuve, where we had everything from marinated fresh tomatoes to monkfish cheeks, topped off by a dessert with a scoop of ice cream so good that Kimberly literally teared up, plus a bottle of Chateaneuf-du-Papes. Stuffed, we headed back to the hotel; had it been a downhill trip, we might have rolled. 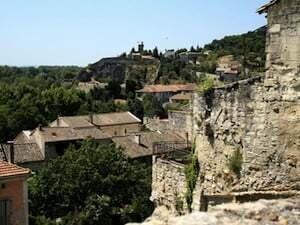 The next day, we set out for Vaison-la-Romaine to visit it on market day. The weekly market was a riot of sounds, smells, and colors. Stalls selling lavender, Provencal cloth, saucisson, olives, honey, clothing, and countless knick-knacks stood side by side. To go with our saucisson from Avignon, we bought a bag of green olives so infused with garlic that it was practically a bag of garlic infused with olives. We also picked up some perfectly ripe little strawberries and one darn fine peach. With this collection, we found a picnic spot in front of a church and devoured our bounty. From Vaison, we drove north to explore lavender country. Soon we were passing bigger and bigger fields colored a vivid, almost electric purple. We could not resist taking a closer look at a few. After drinking our fill, we headed south toward the town of Gigondas, home of one of our favorite wines and the famed restaurant at the hotel Les Florets. Nestled in the jagged mountains of the area, we had lunch on the terrace under sycamores and chestnuts, breathing in perfumed air and looking almost straight up at those stony peaks. The view was matched by the food. A highlight of our rich meal was an appetizer that combined the flavors of foie gras and melon. We returned to Avignon the next evening to find ourselves immersed in celebrations for the opening night of the theater festival. As we walked the streets filled with dancers and costumed performers, we stopped for a pre-dinner glass of rosé and were serenaded by players from one of the shows. Dinner was at Restaurant Numero 75, probably our favorite of the whole trip. Starting off with a crisp, fresh bottle of Cotes de Ventoux, we encountered a life-changingly good mozzarella and heirloom tomato salad. The rest of the meal followed suit. Once back in Villeneuve, we went to a local bar to watch the second half of the World Cup match between Germany and Spain, even conversing a little with fellow-patrons. Everyone there congratulated us when we explained in halting French that it was our honeymoon, and were so willing to try to communicate that it made us feel very welcome. The next few days we spent taking long drives through Provence to see its many gorgeous sights, from the serene Senanque Abbey—although it involved the most frantic driving of our lives—to the majestic Roman aqueduct of the Pont du Gard, from charming hilltop towns to the ruins of the medieval fortress of Les Baux. We went to another market day, this one in Isle-sur-la-Sorgue, a town so full of canals it is known as the Venice of Provence. Among many fine meals over these days, our dinner at L’Estaminet in Villeneuve stood out. The restaurant described itself as serving cuisine of the market, and the flavors we experienced were amazingly fresh and light. Although relaxing, the time flew by, and before we knew it, it was time to head to Paris. We celebrated our time in Provence with one last meal at Restaurant Numero 75 in Avignon, not being able to leave the region without another taste. The next day we took the TGV to Paris and quickly found our way to the Hotel Royal St. Germain in the southern part of the Sixth Arrondisement. The concierge at the front desk spoke excellent English and was very friendly. He gave us a better room than we had registered for because we would be staying for eight nights, and joked with us about our good fortune in finding a polite cab driver in Paris. The hotel was clean and compact, with all the important amenities, including an affordable breakfast served in the lounge. With the help of TripAdvisor, we had chosen it for its very reasonable rates and excellent location near many subway stations and Left Bank attractions, and it served our needs perfectly. After settling in and washing off the dust and sweat of the hot trip, we headed out to get a taste of Paris. We took a long walk through the center of the city, stopping for large glasses of rosé. On our way back, we stopped for food, drink and the World Cup finals at the Tavern St. Germain, a funky little Alsatian place with a good beer selection. We enjoyed our drinks and friendly conversation with fellow spectators while watching Spain defeat the Netherlands in their battle for global soccer supremacy. Having had a taste of walking around Paris, we were hungry for more – a lot more. While waiting for the lines at the Louvre to shorten, we explored Notre Dame. The gothic triumph of this cathedral is breathtaking, and can never be truly appreciated through photos alone. The two towers graced with gargoyles and tourists are a marvel when you ponder the engineering tools available when they were built. Inside, pillars stretch into the darkness to hold up, with seeming lightness, a vaulted roof that extends on and on, and light streaming through brilliant stained glass shines all the brighter for the dim surroundings. We then returned to the Louvre for a speedy entry. Knowing that we would return later in the week, on our first trip we focused largely on sculpture. The Louvre’s sculpture collection is extensive among French work, ranging from the middle ages to the nineteenth century. Even more appealing were some of the ancient pieces in the Near Eastern collection. It can give you a feel for how immense the Louvre really is that we ended our visit having spent several hours on sculpture alone. When we left, what had been an overcast day had cleared up. After a quick snack at a cafe, we wandered through the arcades of the Palais Royale, past the aggressively modern sight of the Pompidou Center, and into the Marais. This quickly became our favorite neighborhood in all of Paris. We couldn’t help but stop for an affogato made with gelato and revitalizing espresso at a small establishment named Pozzetto. While waiting for our appetites to return for dinner we reclined on a kitschy couch at Les Etages, a studiously dive-y bar. Les Etages would be a true dive bar, except that its “diveyness” is so clearly constructed, its quirkiness so fun, and its drinks so good. It was clearly a place the indie crowd would come to talk, debate, and listen to the latest album released by Jack White. At last our appetites kicked in and we walked a block to Les Philosophes. Blessed with another friendly and accommodating waiter, we started with a refreshing bottle of 2006 Chablis. Ben had three rare lamb chops and Kimberly had an excellent steak tartare. The tartare was a big pile of bright pink raw hamburger with a raw egg perched on top. Bottles of Worcestershire sauce, ketchup, olive oil and Tabasco were brought to be added to taste. The flavor was clean and sharp and simple and Kimberly fell in love with it. The next day we climbed Montmartre, which is quite a hike, and not to be undertaken lightly. 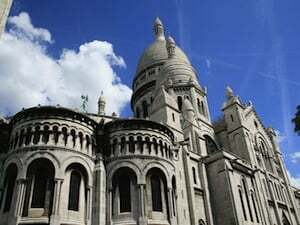 After our ascent, we knew we had arrived when we saw the glowing white stone of the basilica of Sacre Coeur. According to our guidebook, the stone of this massive church cleans itself when it rains, which explains the intense contrasting blackness of the areas below overhangs. Below the church, the hill slopes steeply down and at its base Paris spreads out like a blanket over the flat landscape. After descending the lovely Funiculare, a long staircase that climbs the hill, we stopped at Le Sancerre for glasses of rosé, an exceptional cheeseburger and herbed frites. That night we took part one of Paris’s Bastille Day traditions, the Bals des Pompiers. The Bals des Pompiers, or Firefighter’s Balls, are held at firehouses throughout the city, with all comers welcome for a donation at the door. The party in the Sixth Arrondisement was not far from our hotel. We enjoyed hours of dancing amid crowds of revelers in an ancient courtyard fitted with makeshift bars. The next few days we continued to explore the city on long walks, returning to the Louvre to see its legendary collections of Italian and Dutch paintings. Among many culinary highlights, the best was a picnic on the banks of the Seine. We went to the huge food hall of the Bon Marche, a gourmet’s wonderland. There we picked up wild boar saucisson, gouda, cherries, strawberries, olives, sparkling lemonade, two bottles of Bordeaux, and a baguette. We took our bounty to the Ile de la Cite and spread it out onto a tablecloth bought in Provence. We shared an unforgettable picnic in the golden light of the setting sun as an endless parade of tour boats drifted slowly by. 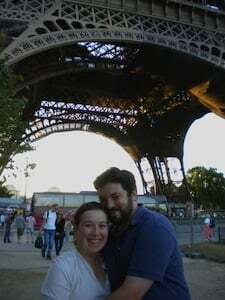 Our last full day in Paris was also the third anniversary of our first date. We celebrated by going to the top of the Tour Montparnasse. We chose a trip up this tower as an excellent alternative to its more famous rival. Since it has no long lines and the breathtaking panorama includes the Tour Eiffel. It was an apt thing to do on our last day, affording us a view of all the places we had visited during our week in Paris. Our anniversary dinner was a sumptuous meal of steaks au poivre in the Marais and a return visit to Pozzetto for gelato. The next day we had a smooth flight home from Charles de Gaulle airport to Logan, our hearts and stomachs full from our glorious honeymoon. This was a wonderful trip and we would recommend every hotel and restaurant we visited. The total cost of the honeymoon was about $8,000, of which gifts through Traveler’s Joy covered more than half. Traveler’s Joy ultimately helped us enjoy our honeymoon more. Because of the registry, we never had to think twice about the cost before stopping to drink, dine and explore where and when we wanted. This made our adventure free of worry, and what’s more, we carried the love and good wishes of our friends and family in our hearts every step of the way.